Extreame Savings Item! 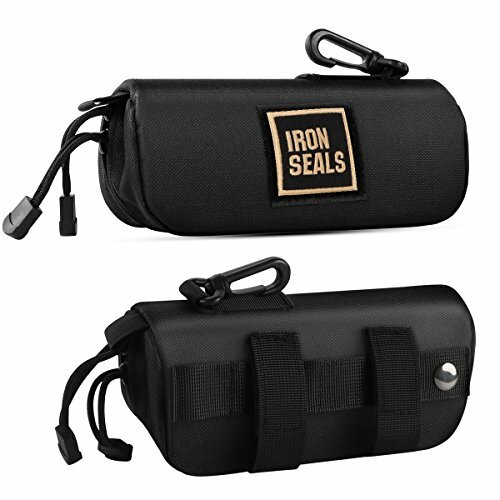 Save 41% on the IronSeals Tactical Molle Sunglasses Case Oversized Anti-Shock Hard Clamshell Glasses Case by IronSeals at Sunglasses Tokyo. MPN: NEW0322018055A. Hurry! Limited time offer. Offer valid only while supplies last. Hard Clamshell Glasses Case: 1000D Nylon outter material, in the middle is hard shell to provides sufficient protection to stop glasses from being broken by lighter pressure. Soft Interior: Double zipper eyeware case with soft interior lining fits your glassess perfectly, protect your glasses from scracthes. Increased Size Design:( Dimensions: 17cm/6.7"*7.5cm/3"*6.5cm/2.6"). Great for all standard sized and most oversized eyeglasses & sunglasses. Multiple mounting options to choose: Attach it to belt, vests or any molle bags with vertical molle strap/horizontal hook and loop - loop panel & hook up on to D-rings with rear plastic clip, you can get your eyeglasses quickly. Come with a mini Screwdriver Keychain Eyeglass Repair kit as a gift (eyeglasses NOT included). Quality Warrant: We offer 100 Days Money Back Warranty. Your satisfaction is our ultimate goal, please do not hesitate to contact us if any question. If you have any questions about this product by IronSeals, contact us by completing and submitting the form below. If you are looking for a specif part number, please include it with your message.